Noon saakinah is a noon نfree from any vowel حركة. It remains unchanged in its written form and as well as in pronunciation when continuing to read after it and when stopping on it. Noon saakinah occurs in nouns and verbs in the middle of the word and at the end of the word, and occurs in prepositions and particles only at the end of the word. The Changing الاقلاب : Here the Noon ن is changed into Meem م. The Hiding الاخفاء الحقيقي : The Noon ن is hidden so it is not a clear noon, but at the same time, not merged into the next letter. The first of these rules, the Ith-har الاظهار or clarity of the Noon Saakinah and Tanween. The word Ith-har اظهار is defined linguistically as: clear or obvious. The applied definition of the Ith-har اظهار is: Pronouncing every letter from its articulation point without a Ghunnah [in this case, without a prolonged Ghunnah] on the clear letter. In other words, when this Ith-har اظهار rule is applied to the Noon Saakinah or Tanween, the Noon ن is pronounced clearly, and articulated from its articulation point. When the Noon Saakinah or Tanween is followed by any of these six letters, the Noon is then pronounced clearly. 2- the second of the four possible rules is Idgham الادغام, or merging of the Noon Saakinah ن and Tanween into the next following letter. The Idgham الادغام is defined linguistically as : merging or inserting. In the Idghaam of Noon Saakinah and Tanween, the Noon is a saakin (non-voweled) letter on the end of a word, and the first letter of the next word is one of the letters that cause the Noon to merge or insert into it. Its letters : the letters in the group: يرملون. This means if a Noon Saakinah or Tanween are at the end of a word, and the letter يـ or ر or م or ل orو or ن is the first letter of the next word, the Noon then merges into this next letter. It is defined in applied Tajweed as: The changing of Noon Saakinah or the Tanween into a م when followed by a ب with the observance of a lengthened Ghunnah on the letter Meem. 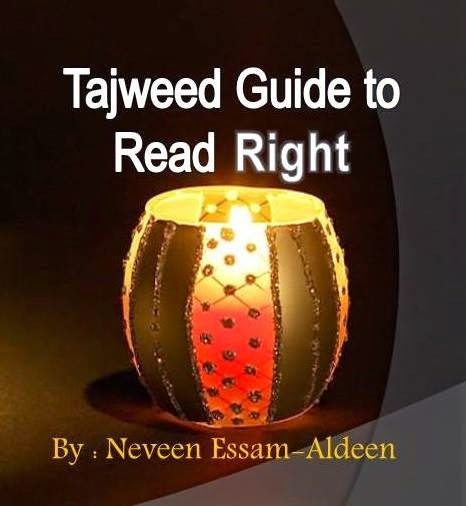 If the letter ب occurs immediately after a Noon saakinah in the same word, or between two words (meaning the Noon Saakinah or the Tanween would be at the end of word, and the بthe first letter of the next word), it is then required that the reader changes the Noon Saakinah or Tanween into a hidden Meem, with a Ghunnah present. The Noon Saakinah is changed into a Meem in pronunciation, not in the written word. You may note that most copies of the Qur’an have a very small meem written over or under the noon in this case, or the second line of a fat-h or kasrah tanween or Dhammah of the Tanween is replaced by a small Meem. The Meem hidden, not by leaving a small space between the lips, as some modern scholars have said, but by closing the lips and holding the Meem for the length of the Ghunnah, then opening them with the ب . 4- The Ikhfa الاخفاء الحقيقي , the last of the four rules for the Noon Saakinah and Tanween. The applied definition of the Ikhfa الاخفاء الحقيقي is: The pronunciation of a non-voweled letter stripped of any shaddah, characterized somewhere between an Ith-har الاظهارand an Idgham الادغام with a Ghunnah غنة remaining on the first letter, in this case the Noon saakinah and the Tanween. If a Noon Saakinah or Tanween is followed by any of these 15 letters, we hide the Noon. The Ikhfa الاخفاء can take place between two words or in the middle of a word. To hide the Noon our tongue does not touch the teeth or gum, instead our tongue moves close to, but not at, the articulation point of the next letter, which is the letter causing the Ikhfa الاخفاء (hiding). We then hold this sound with an accompanying Ghunnah (غنة) for the amount of timing appropriate for the Ikhfa الاخفاء.